If you are injecting vitamin B-12, B-complex, insulin or some other medications at home, then you should be aware of crucial safety protocols. Most people are well versed by their healthcare practitioners, but it is doesn’t hurt to review proper disposal methods when it comes to sharp and potentially dangerous objects. Those of us with children and pets roaming our houses should be especially cautious with our sharps trash. Safely storing and then disposing of your used needles is an obligation we owe to all of our neighbors. No one wants to be responsible for another human or animal being stuck by a new or used needle, the health risks are just too high to be negligent. Always store your new and used needles out of reach of children and pets. It is our humane duty to properly dispose of our injection waste in a safe manner. 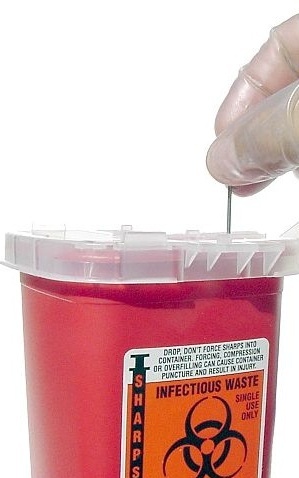 Buy or make a sharps waste container to dispose of your needles and syringes. 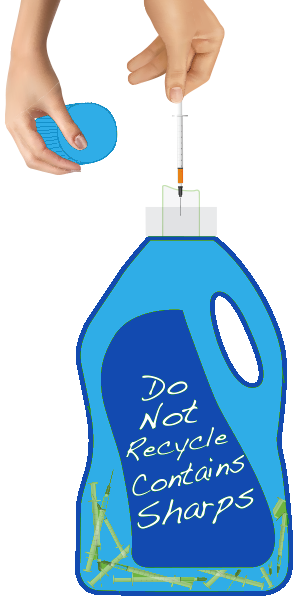 Store your used needles in your sharps container until it is full, and then locate and dispose of your container at your local sharps container disposal center. Sharps refers to all sharp bio-hazard materials. Locate and buy a sharps biohazard container or fashion your own from a hard plastic container. Place all needles and syringes into a sharps disposal container immediately after use. Dispose of used sharps containers according to community guidelines. Until you locate a sharps container, you can set aside an empty glass or plastic bottle and properly label it to avoid confusion of it thrown out as normal trash. Peel off or mark out the old labels and re-label with a thick permanent marker “SHARPS”, to warn others of its contents. Peel off or mark out the old labels and re-label with a thick permanent marker “SHARPS”, to warn others of its contents. A used empty liquid laundry container is an easy to make and use option. Make sure that the container you choose has a tight fitting lid, no holes and its plastic is thick enough to prohibit punctures. If you have any questions about proper disposal of your used needles and syringes, contact your local city council or call your local hospital.